Glossy HOME CARE luxury Sheen Emulsion is an exquisite emulsion paint that provides a luxurious finish and a silky glowing appearance to your walls. Glossy HOME CARE Luxury Sheen Emulsion is an interior wall finish that can be applied on all types of smooth plasters, false ceilings, asbestos sheets, concrete etc. On smooth primary masonry surface by brushing: 1 Coat: 26-30 sq mtr/ltr. 2 Coats: 14-16 sq mtr/ltr. Surface Dry Time:15-25 Minutes. Complete Dry Time: 3-4 hrs. 1 ltr, 4 ltr, 10 ltr, 20 ltr. 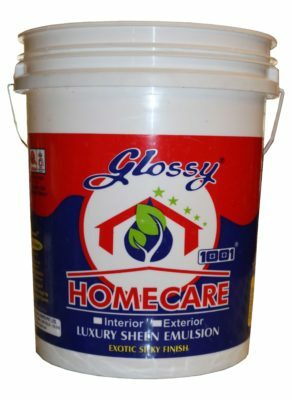 Glossy HOME CARE Luxury Sheen Emulsion is a water based 100% acrylic, interior wall finish.. It procides a silky sheen finish which lends a soft regal glow to the interiors of the room. It has excellent flow giving a near brush mark free finish. It also offers high stain resistance-wall painted with HOME CARE are easy to clean and maintain that new look for years. HOME CARE also offers good anti-fungal properties. 3 Years from the date of manufacture in original tightly closed container. Stay away from direct sunlight and excessive heat. Stability of Thinned Paint: Use within 24 hrs. Home Care is a water based paint which is not flammable.